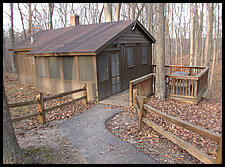 McCormick's Creek State Park operates family housekeeping cabins to provide all the comforts of home in your own private cabin. Cabins are very popular, so reserve early! Completely furnished, family housekeeping cabins are available from April through October. These are modern cabins with gas heat. Visitors will need to bring cleaning supplies, bedding, pillows, towels, pots & pans, dishes and silverware. Each of the 13 full-size family cabins sleeps 6 people in one bedroom, two bunkbeds, and one sofa sleeper. Each cabin offers privacy and comfort with a living room, gas stove, refrigerator, screened-in porch, and full bath (shower only). The 1 ADA accessible family cabin sleeps 4 people in one bedroom and one sofa sleeper. The cabin includes a gas stove, refrigerator, living room, ceiling fans, screened-in porch, and full bath.